Includes more than 120 built-in functions. Features a 99-step memory capacity lets you program repetitive calculations. Includes more than 120 built-in functions. Lets you calculate mortgages, balloon payments, depreciation, bond yields and more. Compute time value of money for savings, loans, leasing, amortization schedules, price and yield of bonds, cash flows, date arithmetic, depreciations and percentages. Features a 99-step memory capacity lets you program repetitive calculations. Saves time and effort. Compact design — 3.14"H x 5.07"W x 0.6"D. Batteries and a case are included. The Platinum edition has all the same features as the HP12C standard, plus a 400-step program memory, RPN and Algebraic entry modes and more than 130 built-in functions. 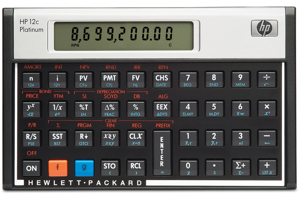 A time-tested performer, the HP 12c has an easy-to-use layout, one-line LCD display and efficient RPN data entry. Easily calculate loan payments, interest rates and conversions, standard deviation, percent, TVM, NPV, IRR, cash flows, bonds and more. Over 120 built in functions. Keystroke programming Memory capacity: 399 steps. Business/Financial Features Statistical/Mathematical Features, Time and Date Management, and Customizing Features, Attractive one line x 10-character LCD display, Select business functions at your fingertips, Great mix of statistic, business and math functions, Read display results easily, even at an angle. TVM (loans, savings, and leasing) Amortization Bond price and yield to maturity Cash flow analysis NPV, IRR Memory for up to 20 cash flows SL, DB, SOYD depreciation methods % change, % of total. Cumulative statistical analysis Std. deviation, mean, weighted mean Linear regression Forecasting, correlation coefficient Total, Σx, Σx2, Σy, Σy2, Σxy +, -, x, %, ÷, 1/x, ±, LN, ex, n! Real estate, finance, accounting, economics and business work. Permitted for use on the CFP and CFA Certification Exams, and GARP FRM Exam.